I’ve had a paint brush in my hand every day for the last few weeks. It just hasn’t been the kind of brush I most prefer. Still, I can’t complain: my to-do list has grown considerably shorter and our house is much improved. But now that this round of projects is complete, I am eager to get back to a regular routine of journaling and adventures with watercolor. 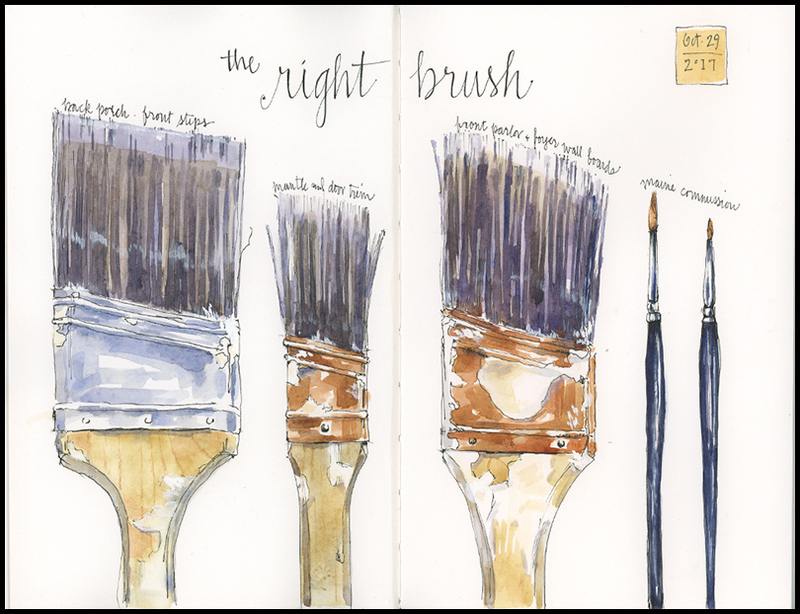 Tips and Techniques– Do you struggle with finding subject matter for your sketchbook? There are lots of online sketch challenges that provide daily suggestions, and they may be a good option for you. My preference, however, is to pick subjects that relate directly to what I’m doing or what’s happening around me…even if it’s old paint brushes. When you choose subjects that relate to your day-to-day experiences, your journal will reflect more of your life and tell more of a story about what you see and what is important to you. This entry was posted in Journal and tagged ordinary things, sketchbook by Jean Mackay / Drawn In. Bookmark the permalink. Nice brushes, Jean 🙂 Many a brush have I sketched, each with its own character. The best ones are the most worn down and wretched – of course! Yes. Painting these made me realize that we need new brushes! They have endured many projects! Love these brushes paintings. You really capture the hard work they’ve done. And I applaud your choice of objects in your daily path as subjects. I return to my 30 art journals volumes constantly to remember the days of my life. Thanks Jessica– they have proven to be good brushes that have served us well. 30 art journals is a lot of living! It is fun to look back and rediscover experiences between the pages. That’s very good advice! I like the balance between orderliness and spontaneity in the painting – and I’d guess that’s a quality I always find attractive in your work. Thanks– I’m good on order and have worked at spontaneity and loose lines. It’s a good combination! I so enjoy the lyric quality of your lines and colour, just wonderful! Thanks! This was a fun piece to do. Sort of marks a transition for me away from house painting and into watercolor painting for awhile (well, until the next room strikes). I love that idea of sketching your day-to-day life. I think the results are pretty fantastic – particularly looking back. Thank you. Let me think about it and check out your site and get back to you.